I’m sometimes asked how psychology might explain events that seem so strange that they suggest the existence of paranormal activity, for example when you’re thinking about a friend and how you haven’t talked to them for a while, and then the phone rings and it’s them. These events seem so very unlikely, it seems impossible that they could happen by chance. The explanation that it’s just a coincidence doesn’t seem very persuasive. However, sometimes an unpersuasive reason is the right one, and the reason why unusual events sometimes occur comes down to the law of large numbers. Any event that can be possible, including bizarre coincidences, has some chance of it happening, even if that chance is very small. However, there are so many events, and so many people to potentially experience them, that even the most unlikely of coincidences is likely to happen now and again. Hence the picture above. I was making an omelet last night, and was surprised to find when I cracked the first egg that it had a double yolk: I haven’t had that happen to me for a long time, probably because the chances of an egg having a double yolk are about one in a thousand. I was considerably more surprised when I cracked a second egg, and found that it too had a double yolk. If the events (each egg crack) are independent (though they probably aren’t), then the chances of that happening are one in a million. When I cracked the third egg and found another double yolk I must confess to feeling a bit spooked. When the fourth egg was a single yolk I was a little disappointed, but also a little relieved: it meant I could stop looking for pixies at the bottom of the garden! Then the fifth and sixth eggs were also double yolks, and I started feeling spooked again. 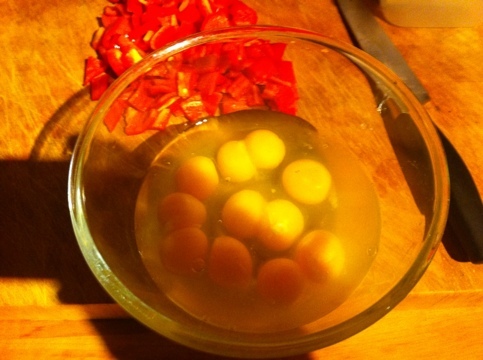 Six eggs produced 11 yolks, pictured above. The chances of that, if the events are independent, are infinitesimal: let’s say one in a billion for a nice round number. And yet, it happened. Even if the chances are one in a billion, given the number of people buying eggs on a regular basis then there will be times that people find multiple instances of double yolks. The Mail quote odds of a trillion to one for that, again based on the events being independent. As some of the comments point out though, it’s unlikely that the events are independent, and the odds of a double yolk are probably greater than one in a thousand for large eggs (eggs with a double yolk are more likely to be large), and perhaps for free range eggs. Still, I buy these eggs regularly, and have never had a double yolk before, so it’s still a pretty unlikely event. I refuse to believe the commenter in the mail post who claims 11 out of 12: that’s too far fetched even for me! Um obviously as you say the odds of more double yolks is not independent: one wonders what the chickens diet is that leads to it. 🙂 still if you retrospectively calculate odds they can seem very high but that leads me to think about significance. Is one in twenty really a high enough threshold for an experiment unlikely to be replicated? On the psychology of paranormal experience i’m just reviewing Jinks T. (2012) “An Introduction to the Psychology of Parnormal Belief and Experience”; McFarland, London for a journal and it is excellent I think as an overview for the undergrad or interested lay person. Recommended.